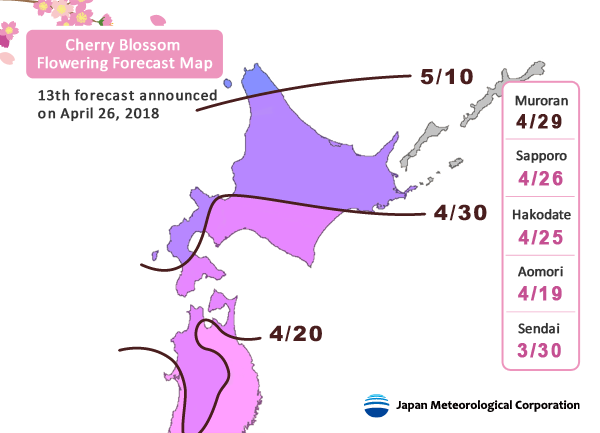 On April 26, 2018, JMC released its 13th forecast of the dates when cherry blossoms will start to flower (kaika) and reach full bloom (mankai). JMC has estimated the flowering and full bloom dates for Somei Yoshino (Yoshino Cherry) trees in approximately 1,000 cherry blossom viewing locations in cities from Hokkaido to Kagoshima. The flowering or full bloom is announced. The flowering meter provides a quantitative measure of cherry trees' current progress toward flowering and full bloom, allowing you to enjoy not only the actual flowering and full bloom of cherry blossoms but also the run-up to the flowering. The flowering and full bloom dates of cherry blossoms depend on the temperature patterns from autumn of the preceding year. The buds of cherry blossoms are formed during the summer of the preceding year. Before they flower, they must go through two processes: dormancy and growth. Buds do not start growing as soon as they are formed; they first enter a period of dormancy. Dormancy allows the buds to survive the winter, with its cold weather and short days. This phenomenon is not exclusive to cherry trees. In temperate zones, many kinds of plant certain levels (between -5 and 15 degrees centigrade) during the autumn and winter period, trees awaken from their dormancy in anticipation of the approaching spring. After breaking dormancy, the buds enter the growth stage, and grow as the temperatures increase to flowering. During this stage, the higher the temperature is, the better the growth rate will be. During dormancy, buds do not show any visible development. However, once they enter the growth stage, they will grow increasingly large as the moment of flowering draws nearer. Eventually, their tips will turn a yellowish green color. Just before they start to flower, it will be possible to make out their petals. JMC has devised its own method for forecasting flowering and full bloom dates based on existing research on the forecasting of flowering and full bloom dates for Somei Yoshino (Yoshino Cherry) trees. JMC estimates the flowering and full bloom dates for each area based on low temperatures during autumn and winter, cherry tree growth status, cumulative temperatures, and past data for each area. JMC developed the flowering meter as a quantitative measure of cherry trees’ progress toward flowering and full bloom, which means that you can enjoy not only the actual flowering and full bloom of cherry blossoms but also the run-up to the flowering. The flowering meter has three indices corresponding respectively to the three stages of cherry blossom development. - Japan Meteorological Agency, "Atarashii sakura no kaika yosō (New forecast of cherry blossom flowering dates)" in Kishōchō kaisetsu shiryō (Japan Meteorological Agency explanatory materials), No. 24, 1996. - Yasuyuki, A., Chiaki, M., "Kyūmin kaijō o kōryoshita someiyoshino no kaikabi suitei moderu no ippanka (A generalized model to estimate flowering for cherry tree [prunus yedoensis] considering both processes of endodormancy completion and development)" in Journal of Agricultural Meteorology, 59(2), 2003, pp.167-177. - Asakura, T., Sugiura, H., Sakamoto, D., Sugiura, T., Genma, H., "Sakura no mankaibi o kōiki de yosokusuru moderu (A universal model for predicting the full bloom date of Japanese flowering cherry" in Journal of Agricultural Meteorology, 66(4), 2010, pp.269-277.